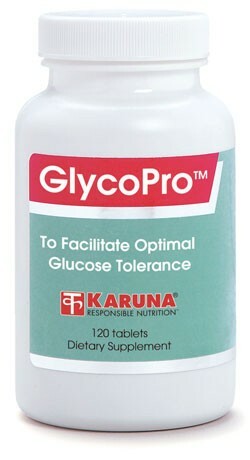 GlycoPro provides a complex of nutrients, botanicals, and phytonutrients to support the intricate balance of glucose, insulin, and lipid metabolism, as well as to protect tissues exposed to glucose. Included are several nutrients important for normal glucose and lipid regulation that may frequently be low in blood and body tissues. Antioxidants supplied specifically protect tissue proteins from undesirable glycosylation. Few products can match the broad spectrum support GlycoPro provides for healthy glucose metabolism. Magnesium, subnormal levels of which can often be found in blood and tissues, has important roles in normal glucose metabolism (Magnes Res 1998;11:25-42; Am J Clin Nutr 1992;55:1161-7; Diabetologia 1990; 33:511-14). Vitamin C supplements support normal blood sugar and lipid metabolism in those with low vitamin C status (Nutr Rev 1996;54:193-202; J Am Coll Nutr 1995;14:387-92). Vitamins C and E help protect blood vessels, kidney tissue, and nerve function from excessive concentrations of glucose that can lead to undesirable glycosylation of tissue proteins (Diabetes Care 1998;21:1915-9; J Am Coll Cardiol 2000;36:94-102; Diabet Med 2001;18:756-60; Am J Clin Nutr 2001;73:1052-7). L-Carnitine, an essential intracellular component for lipid utilization, supports normal glucose-related regulation of blood cholesterol and triglycerides (Nutr Rep Int 1984; 29:1071-9). Gymnema sylvestre has shown promising effects on promoting optimal natural insulin function (J Ethnopharmacol 1990;30:281-305). Optimal antioxidant and platelet function are important for preservation of health and can be effectively promoted with a wide variety of natural substances, such as vitamin E (Atherosclerosis 1997;128:97-105), ginkgo (Pharmacol Rev 1987;39:97-210) and quercetin (Clin Chem 2000; 46:1162-70). Suggested use for adults: Four tablets daily, or as directed.